Sometimes, bigger is better. The girls have SO much fun making these larger than life crafts. Tasha (6) and Kaitlyn (2) both enjoyed this project (especially trying to hold it up for the camera... )! 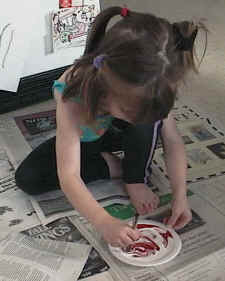 Take four full sheets of newspaper and lay them on top of each other (it's best if the top and bottom sheets are just black and white as it's harder to paint over the colored newspaper). Fold the newspaper in half diagonally to make a triangle. OPTION: instead of stapling, punch holes with the hole punch all the way around. Use string or wool and sew up one of the sides. Open up your pouch. Stuff with crumpled up newspaper. Staple or sew the other side shut. Now do the WHOLE thing again to make a second triangle (wing). Take two more full sheets of newspaper and fold in half (the normal fold of a newspaper) and then half again to make a body shape. OPTION: instead of stapling, punch holes with the hole punch all the way around. Use string or wool and sew up two of the sides. Staple or sew the third side shut. 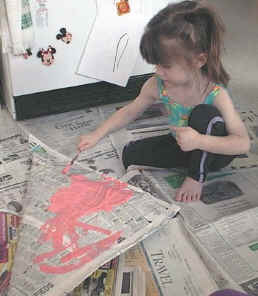 Paint the butterfly wings a base color (we used 1/4 crayola red and 3/4 crayola white to make this pink color). You could also use a sponge or a rag to spread it around. You may wish to do a second coat. Fold a piece of white paper in half and cut out a circle (you'll end up with two identical circles). 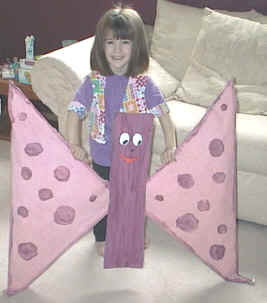 Staple the wings onto the body (an adult should do this) and hang up your butterfly!